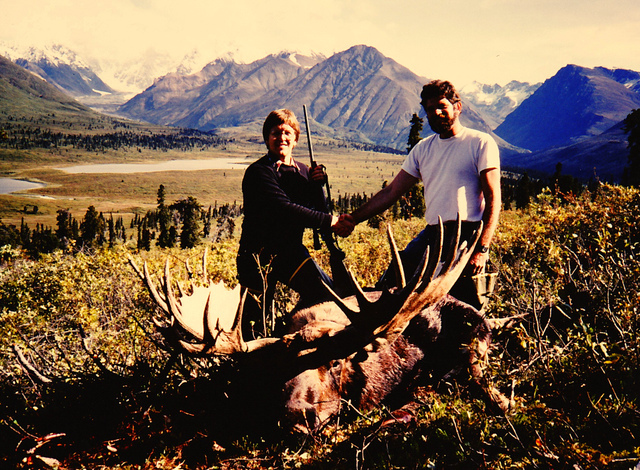 Back in ’83 when I first started guiding, my third client was a moose/caribou hunter. I was working for Rich Guthrie in the Brooks Range. He had a decent moose area with a few 60 inchers. He dropped John Ribic, a bow hunter from Ohio, and me off on a small strip with his “super cub.” He told me this was one of his better areas. After setting up camp I got everything ready for the next morning’s hunt. The first hunting day I found three nice bull moose lying out in a fairly open area. The largest one was mid-to-low 60’s, one around 60 and the smallest in the mid-50’s. Since they were in the open I knew it was going to be a difficult stalk. We were able to close the distance to seventy yards and I told John he was on his own. There was heavy scrub brush with numerous moose trails surrounding them. I told him to belly crawl and push his bow in front of him on the moose trail in front of us. He chose to get down on all fours and hold his bow above his head. The moose quickly spotted him, got up and left the area. The following day we found a moose in the mid-50 range, made a good stalk and John put an arrow in him and had his moose. After skinning I packed the moose back to the strip. It was only a half mile pack so that wasn’t a big deal. That night it snowed about six to eight inches and the temperature dropped to below freezing. I was concerned that Rich wouldn’t be able to land in the snow so I started kicking the snow off the strip. I was about half finished when Rich showed up. He made a good landing and asked me to help throw out the fifty pounds of rocks that he had put in the back of the plane to keep it from going over on its nose. A “bush flying” lesson learned. He loaded John and his gear and said he would be back for me and the moose meat later. I continued kicking the snow off the strip. Rich returned for me and then made another trip to get the rest of the meat. John Ribic with his 53" moose that he took with his bow. That was my last client for Rich so I headed back to Anchorage and then down to the Alaska Peninsula where I would be guiding for Tracy Vrem for moose and caribou. Tracy assigned Ted Epley, an elk guide from Idaho, as my first client. Early the first morning of the hunt I spotted a nice moose bedded down in some low willows. We moved to about four hundred yards from the moose so I could get a better look at him. He looked like a big moose but he only had two brow points. The legal size requirement in that unit for moose antlers back then was 50 inches or three brow points. We watched the moose most of the day as he gave us numerous different views of his antlers but not being an avid moose hunter I was concerned that he might not be legal. I told Ted that I thought the moose was around 56 or so and that I wanted him to get at least a 60 incher. He told me that with the experience he had with mule deer and elk he knew the moose was at least 60 inches. The moose stood up and started moving our way so I got him set up and when the moose stepped out of the brush he looked enormous. I said, “Take him!” One shot and he was down. The moose’s antlers taped 65”. Ted said, “I told you he was bigger.” I told him that I had gotten my numbers backwards. It was a great moose and two days later he killed a 395 point B&C caribou. A super hunt. Ted Epley with his 65" giant moose. My next hunter was Tommy Smith from Texas. They flew us out from base camp in a float plane to a small lake where Tracy’s pilot had spotted a bull moose earlier in the season. The moose was only 100 yards from the lake so we had to camp about a half a mile or so around the lake. After a short night of rest, at first light we moved to within two hundred yards from where the moose was lying. I wanted him to get up but not knowing how to call a moose I just made a crude grunt and the moose stood up broadsided looking at us. It took two shots to put him down but he fell about 50 yards from the lake’s edge. The moose was a dandy 61 incher. It was one of my easiest moose packs. Life was good. I was now 100% with my three moose hunters. Not bad for my first year guiding for moose. Tommy Smith and me with his 61 1/2" moose. 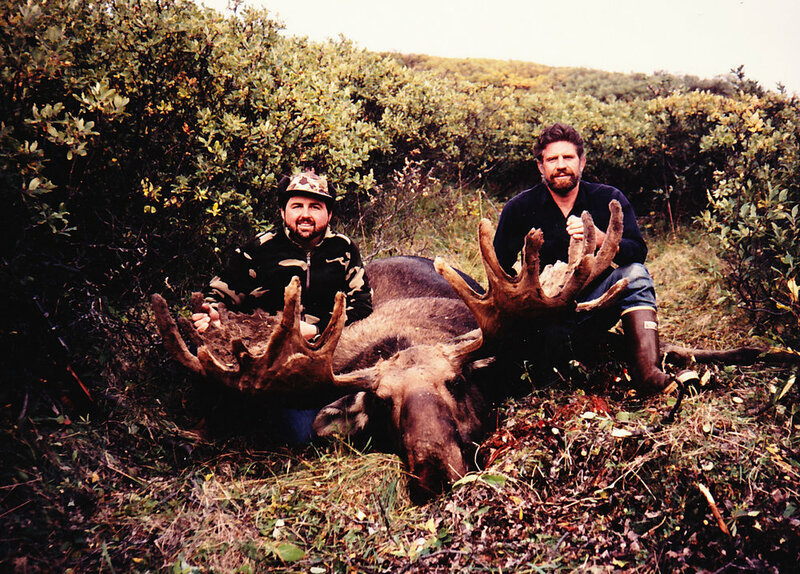 1984 was AAA Alaskan Outfitters first year in the guiding business. We had a very successful spring bear season taking two Boone & Crockett brown bears. Brent and I spent three weeks in July in the Wrangell Mountains repairing the cabins at Bryson Bar and Big Bend Lake and getting everything ready for our first clients. We had four successful sheep hunters in August and during that total period we only spotted one cow moose. It was now August 31st and we had two moose hunters coming in. What were we going to do! Our first moose hunter was Bryan Kettel a good friend and Real Estate agent from Anchorage. We greeted him as he got out of the plane and showed him around the camp. It was a beautiful fall evening and the excitement of the hunt was in the air. I told Bryan that we had not seen any moose and were willing to upgrade his hunt to a sheep hunt at no extra cost. He said he really wanted a moose and for us to wait a few days to see what we could find. Later that evening Paul Claus stopped by in his cub and said he had seen a couple of bull moose down Young Creek. That was sure good news for Brent and me. At least we knew we had some in the area. The next morning we were up early, ate breakfast and were spotting from our cabin. We had an old 55-gallon drum beside the main cabin that we could use to climb up on the roof. Around 8:30 AM we spotted a moose on the mountainside across the lake from the cabin. He looked like a nice moose so we saddled the horses and rode around the lake. Once on the other side the vegetation was so high we had a hard time finding the moose. We climbed a couple of different trees and finally located him. We decided he was a shooter and got Bryan ready using a tree for a rest. The moose finally gave Bryan a shot as he was going up the hillside and Bryan connected. Moose down! Once we made it to the moose through the thick brush we celebrated a super moose. He had a 62 ½ “spread. Going from no moose to this dandy was great. That was my first moose pack using horses and man I loved it. That’s the only way to pack a moose. Bryan Kettel and me with his beautiful 62 1/2" bull. Three days later Dan and I guided Fred Franz, from Delaware, to a heavy browed 57 incher. Another horse pack so life was good. We had hired Dan to help us with our three clients. Fred Franz and me with his heavy browed 57" moose. Fred was 76 years old. In 1987 I ended up taking Greg Hedgis, from Ohio, on the horses up above our Bryson Bar Camp and he scored with a 64” beauty. His antlers were still in velvet and was the only moose that I had ever been in on that was in velvet. Greg Hedgis and me with his 64" moose with the antlers in velvet. Later that season, Tony Lee allowed Brent and me to bring two moose/caribou clients to Otter Lake to check out the area. We were considering purchasing his operation in that area. I would be guiding Leonard Anderson, from WV, who I had guided to a 40” ram in the Wrangell’s. Brent guided Bobby Gross also from WV. Tony dropped Leonard and me off on the King Salmon River. Leonard harvested a nice 57” moose and then we were moved to the Klutapuk Creek area where he took a magnificent 440 point SCI caribou which also scored 403 B&C making that record book. Bobby took a 62” moose and a nice caribou. AAA took over that area the following year and we called it our Western Alaska area. Leonard Anderson with his 57" moose taken in Western Alaska. Once we had an area where we could have six to eight clients at a time for moose, caribou and brown bear, I had to spend most of my time flying the clients into spike camps and all the other responsibilities that come with having that many clients. I would on occasion guide clients out of main camp but they were aware that I had to fly every three days to check on other clients in the spike camps. I would also go out with the different guides that were guiding out of main camp because I loved being out in the field with the clients. In 1999, Dennis Byrne was guiding Chris Parrack, from Texas, for moose/caribou out of base camp. The opening morning of moose season I decided I would go out with them to the creek drainage behind the camp. We spent most of the morning moving slowly and glassing the drainage. Right after our lunch snack I decided to head back to camp so I could go check on the spike camps. On my way back I spotted a big moose. I moved back quietly to where I left them and told them about the big moose. We moved back to where I had spotted him and there he was. Dennis got Chris set up and with one well-placed shot the moose was down. It was a giant 68 incher. After celebrating and many photos we got to work butchering this massive moose. Two of our packers, Chris Moore and Eric Spitzer, were in camp and heard the shot so they came over and joined the party. It was great having all the help and the pack was only about 600 yards. (L to R) Dennis Byrne, client Chris Parrack and me with his massive 68 incher. In 2002 I guided Tom Wells, from Missouri, out of Otter Lake for moose. I had guided Tom on a 10’ brown bear at our Dog Salmon area and a 38” ram in the Wrangell’s. The first morning of his moose hunt I took Tom to the little creek behind the camp. We had taken moose out of that drainage in the past but had not spotted any in there that year. Along with Tom and me were Tom’s son, Tom Jr., Ron Watts and Tom Losk both guides who were helping me. When we got to the ridge above the creek Tom asked, how long we were going to stay? I told him to get comfortable that more than likely we would be there all day. No more than he sat down I said, “Moose, big moose!” Looking through my binoculars, I could tell he was a good moose. We checked the wind and made our stalk. Within forty-five minutes the moose was down. The moose was a 58 incher which made Tom a happy camper. I think he was one of my luckiest hunters. It worked out great with all the help and a good learning experience for assistant guide Tom Losk. (L to R) Tom Wells, Tom Wells, Jr., Ron Watts, myself and Tom Losk with a really nice 58 incher. That was the last moose hunt that I participated in while in the guide business. Since I’ve retired three of my grandkids have taken moose. It’s now up to them to keep me busy hunting those giant animals.